The Goldendoodle is a hybrid dog breed resulting from breeding a Poodle with a Golden Retriever. This is a wonderful cross breed that is growing in popularity every day.They are highly affectionate, gentle and patient. 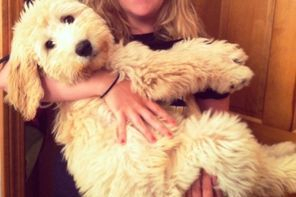 The Goldendoodle loves to be a full-fledged family member, taking part in all activities in your busy family life. They are very loyal, love children and are extremely easily trained. They excel at agility trials. They enjoy winter activities and playing in the snow, so long as they can come in and warm up with you afterwards! In the summer, they enjoy the water, often swimming and boating with their families. As a general rule, they get along well with other pets and animals. Basically, they love everyone! They are loyal and with proper reward based training, can be highly obedient. They love to please their humans! Harsh corrections could damage their confidence. They definitely have a playful side and can be mischievous if the mood hits! Our Goldendoodles mature about the size of a Golden Retriever (60 lb. average). Just like children, some are larger and some are smaller! The F-1 Goldendoodles are 50% Golden Retriever and 50% Poodle. They are compatible for most families with MILD allergies, but folks with severe allergies should have a look at the Double Doodle. Both the F-1 and the F1-B have the same temperaments and intelligence. The only real difference has to due with the allergy factor. From breeding for several years, we find that coats can vary from puppy to litter. Some have a straighter coat while other tend to be wavy and fluffy. Most first generation Goldendoodles shed very lightly. The straighter the coat, the more shedding you will see. However, compared to a full Golden Retriever, the shedding is significantly reduced. We get all types of coats in both generations. We do our best to determine what type of coat your puppy will have, but we cannot guarantee a particular coat type as they are hybrids, and it all depends how the genes align. The back-cross (F1-B or Double Doodle) is produced by crossing an F-1 Goldendoodle with a non-related Poodle. Double doodles will have a higher success rate for non-shedding, and are recommended for families with moderate to severe allergies. The F1-B Goldendoodle is 75% Poodle which makes this generation the most hypoallergenic of all the Goldendoodle generations we breed. The coats usually have a beautiful loose wavy to curly plus coats, but remember that each puppy is different. Please keep in mind that the Double Doodle will not look like a Poodle or have the temperament of a Poodle. The 75% Poodle in their generation strictly pertains to the non-shedding and hypo-allergenic factors. There are usually puppies in each litter that have the loose-wavy coat that look exactly like the F-1 Goldendoodle. We get all types of coats in both generations. We do our best to determine what type of coat your puppy will have, but we cannot guarantee a particular coat type as they are hybrids, and it all depends how the genes align.